How can we scale distribution and sales networks that create opportunities at the BoP? Expanding access to goods and services for the billions of people at the base of the pyramid (BoP) is not simply a growth opportunity – but a business necessity. However, reaching low-income markets often requires navigating fragmented - or in many cases, nonexistent - distribution and sales networks. In recognition of this complexity and the challenges facing micro-enterprises in downstream value chains, a growing number of large companies are employing inclusive distribution network models that seek to empower low-income entrepreneurs and strengthen enterprises while helping companies increase sales and reach new markets. For the handful of these networks that have successfully reached scale, there are many more that have remained siloed CSR initiatives, morphed into non-profit entities, or simply faded away. This online discussion is part of the Inclusive Distribution Challenge and coincides with the launch of a new discussion paper, which identifies three models of inclusive distribution and highlights eight emerging lessons on how to achieve scale. This online discussion aims to crowd-source more examples and input on business actions and partnerships and help prioritize Phase 2 of the Challenge focused on specific solutions to scale. 1. What are some examples of inclusive distribution networks, and how are they expanding opportunities at the BoP and creating value for businesses? 2. What are the most significant challenges to scale these models, and how do they vary across models, regions, and/or industries? 3. What are some emerging lessons and solutions on achieving scale, and where are there opportunities for more partnerships? Glad you can make it, Fernando! Good morning / good afternoon everyone, and welcome to the live segment of this online discussion on how to scale inclusive distribution networks. My name is Abby Mackey and I am the Grants and Impact Manager for Solar Sister. Previously, I was at USAID working on the Power Africa program. Happy to be here today! Hello everyone, I'm Caroline Ashley, Editor of the Practitioner Hub for Inclusive Business, and working with a range of entrepreneurs and facilitators across inclusive business. Q1. What are some examples of inclusive distribution networks, and how are they expanding opportunities at the BoP and creating value for businesses? Thanks Jessica. There are of course the examples you already mention in your paper, such as Living Goods. I was interested to see fantastic evidence come out a few days ago, about how Living Goods model can deliver a 27% reduction in child mortality. What's interesting about Living Goods is that they have a distribution model for multiple beneficial goods. Creating such networks is such a big ask that other companies want to use their network, not create their own. FUNDES has developed networks of mom and pop shops. This solution provides consumer goods companies with valuable data for segmentation and micro-understanding, while allowing their independent and fragmented trade outlets to bring their businesses to the next level. Concretely these networks allow mom and pop shops to be grouped together under one name and to benefit from a package of services including trainings and assistance in business administration and in-store execution – both in-person and virtually through simple technology -, standardization, common branding, as well as a platform for cooperation and mutual learning. In parallel, we gather key data not only on the members’ profiles and business performances but also on the markets and ecosystems, in which they operate. Well Solar Sister is one example. We are building a clean energy last mile distribution chain that is made up of women run businesses in Uganda, Nigeria and Tanzania. Women make up the majority of the rural energy poor market in sub-Saharan Africa so Solar Sister has responded with a women-centered supply chain to meet this demand. We have found that more often, women are able to find female customers due to community involvement and strong social networks. Also, women make the majority of energy decisions in their household so it makes sense to target them as the consumers then. for more examples, we actually just published the publication on Inclusive Business for the Fast Moving Consuming Good Sector with IBAN from GIZ, and we address a whole section on distribution channels.. 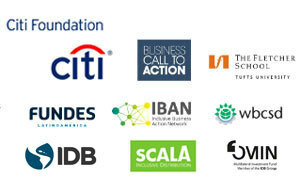 Under SCALA we are supporting the scaling of 6 IDN models: three form corporations (Kiterias, Danone – World Vision Brazil; Plan Barrio, Nestle – ADOPEM; Shatki, Unilever –FUSAI) and three from social enterprises: Mercado Fresco – Supply Hope; Chakipi –Clinton Foundation, Red MANU-Nutrivida. Hello everyone, this is Mauro Homem from Danone Brazil. I´m the Head of Public Affairs and in charge of all the Social Innovation platform.